Based on Clairol's research insights and innovative dye technology, Nice'n Easy is taking its exclusive ColourBlend technology to a new level. Latest research has revealed that tonal variation which creates natural dimension is different between each hair colour shade and lightness level. Translating these insights into product formulations means improved dimension for Nice'n Easy's most natural looking colour ever. Celebrity Colourist and Nice'n Easy ambassador, Belinda Jeffrey says, "Looking to the high-definition technologies used in entertainment and electronics and then transferring that concept to hair colouring is a really exciting step for the beauty industry." Having applied the concept of high-definition technology which exposes every imperfection, Clairol scientists developed a new dye molecule that delivers more natural-looking warm and golden shades. Each of the improved Nice'n Easy shades, which contain this new dye technology, are specifically tailored, ensuring the right level of depth and dimension while preventing brassiness. "I regularly work with TV and movie personalities who know it's not enough to simply cover up imperfections and greys - colour has to be created specifically with the right dimensions for each particular shade. Consumers and my clients all want the most natural-looking hair shade possible and for at-home colouring, Clairol's Nice'n Easy ColourBlend Technology provides the answer," says Belinda. High-definition colour is all about looking really natural, close up and the Nice'n Easy shades work harder to deliver natural looking colour in the comfort of your own home. The innovative shades have the right level of dimension to ensure 100 per cent grey coverage, without making the colour look flat. All Nice'n Easy shades feature the exclusive ColourBlend technology which contains EDDS*. This patented ingredient works with the ions in your hair to ensure consistent colour results every time from root to tip, no matter how many times you dye your hair. The ColourBlend technology was based on the insight that natural hair colour is composed of at least three different tones. It works by blending three different tones in each shade, for natural looking, multi-dimensional results. Look your best for every high-definition close-up with hair colour that delivers a colour so natural no-one will know it's not yours. Clairol's Nice'n Easy maintains colour depth for up to six weeks and provides 100% grey coverage from root to tip. 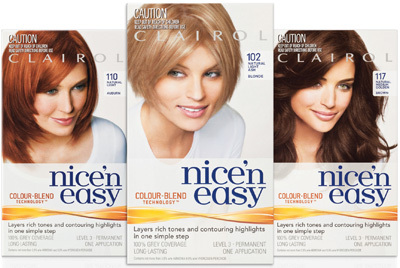 Clairol Nice'n Easy RRP $14.49, range of 37 shades are available in store now - check out our new packaging.